IBS (Irritable Bowel Syndrome) has an unknown cause. Although stress, poor diet, and abnormal muscle spasms in the colon aggravate the condition all that is known is that the muscles in the intestines and colon spasm irregularly and cause cramps, bloating, nausea, and indigestion. In the U.S., roughly 15% of the individuals have experienced IBS. This condition begins mostly in adolescents. The number of women suffering from the condition is twice as many as men. IBS is often connected with anxiety. There has been no known IBS cases which damaged the gut or caused cancer, but the condition is very unpleasant. If left untreated, depression or hemorrhoids may develop. According to doctors, there may be a connection between a neurological issue and IBS. Signals are sent between the brain and intestines. If you are under stress your brain fires either too few signals or too many to intestine muscles. The intestines move food either too slow or too quickly. The person will suffer from constipation and bloating or diarrhea and painful cramps because of it. Those with stress, anxiety, and sleeping disorders could develop IBS. There are OTC meds to cope with diarrhea or constipation and people think they are the best treatment method. These medications provide only short-term relief. It does not fix the source of the problem. With IBS being linked to anxiety and stress, the professionals have a reason to suggest medications to control anxiety. These medications may relieve IBS, but there's a risk of becoming dependent on these medicines. Be sure you know what synthetic materials are in the drug, so you know what side effects you get from taking them. If you use Bavolex daily and follow the tips in our eBook, you'll see a symptomatic improvement in just a few days. A small percentage of our customers do not respond to our product, for this case we offer 60 days full money back guarantee. Our promise is simple: If you are not absolutely impressed by the improvement, we don't want your money! Product safety is extremely important for us. 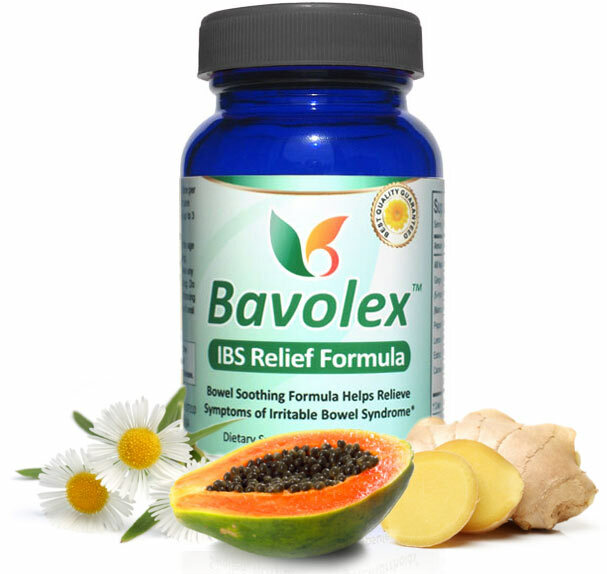 Bavolex™ contains natural herb and plant extracts that are generally considered safe. Our customers have been using Bavolex every day since 2009, and so far no adverse events (side effects) have been reported. As with many other products you should not use Bavolex products if you are nursing or pregnant because the effects on fetus have not been studied. You should not take Bavolex if you are taking blood thinning medication or antidepressants. 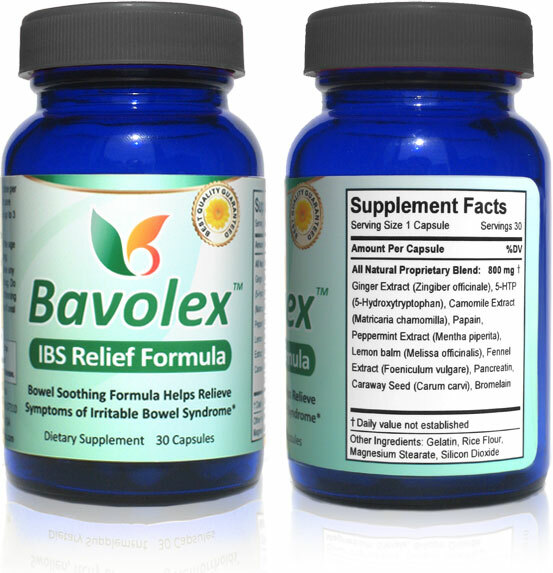 "Bavolex IBS Relief Formula is a dietary supplement formulated with natural extracts and enzymes to help reduce symptoms of IBS. 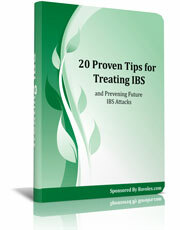 *"
Learn 20 useful tips to get rid of IBS attacks for good. These tips cover stress reduction, diet, and ways to prevent an IBS attack. This no-nonsense eBook is a lesson on simple lifestyle changes.